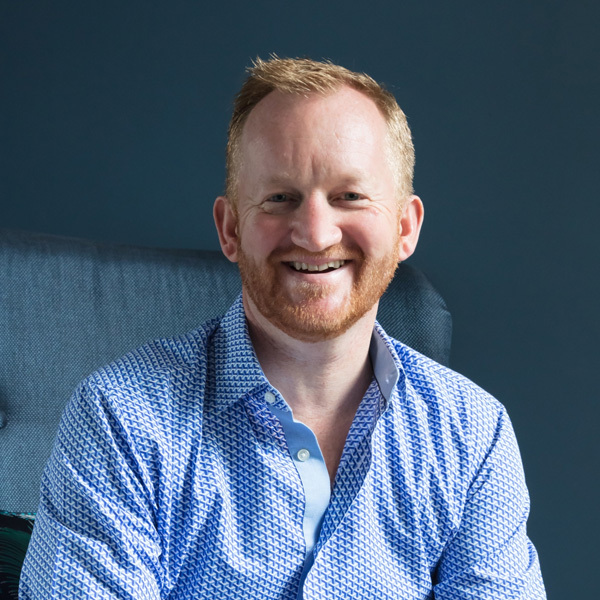 Design director of London Contemporary Andrew Dunning selects his favourite products from our December issue and explains why they have caught his eye. British Ceramic Tile – Inspired by the Nineteenth Century, the V&A Brompton range is made from porcelain so can be used indoors and for outdoor features. Godwin Grey (shown), Abbey Circle and Pugin Filigree make up the range, and are available in 200 x 200mm. 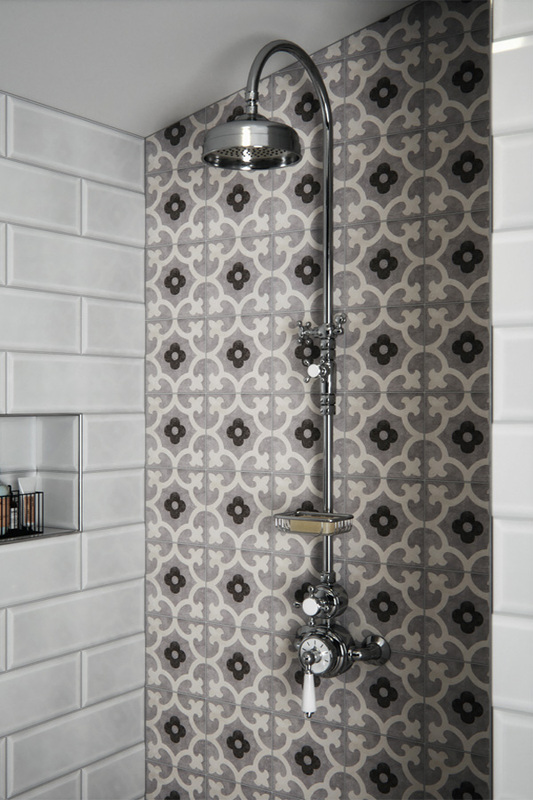 “Featuring a gorgeous pattern in beautiful greys, the V&A Brompton range is a great new product from British Ceramic Tile. “Patterned tiles have seen a recent return to popularity as we’ve seen interiors move away from bland, plain tiles. “Consumers have also become more aware of the history of their homes, and I love that these tiles are inspired by the Nineteenth Century. BC Designs – The Copper Boat Bath range is available in a choice of three finishes. Designers can choose a hand-crafted bath in Copper, Copper & Nickel and Nickel and Tin (shown) finishes. The company also manufactures complementary Push-Down Bath Wastes to match the range. 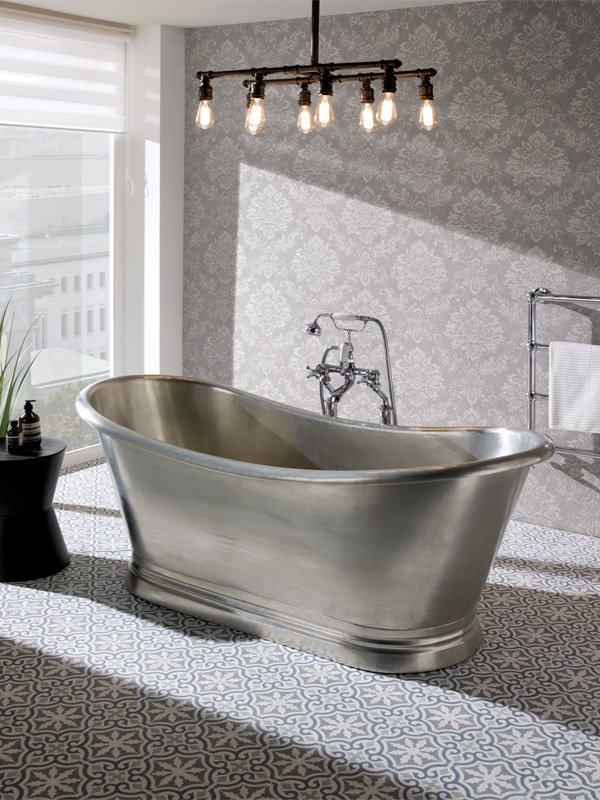 “Like British Ceramic Tile, this is another nod to history, and this beautiful Boat bath from BC Designs is now available in three fantastic metallic finishes. “Roll top baths have become very fashionable recently, and if you have the luxury of space, this can create a wonderful feature. Fisher & Paykel – The RF540ADUB5 black stainless steel fridge freezer measures 1790 x 900 x 695mm and has a capacity of 541 litres. The 430 grade brushed stainless steel has a black PVD (Physical Vapour Depositor) coating. It also features a slim-line water dispenser to maximise fridge space. “My favourite style of refrigerator is the French door style; I always specify it for clients and they love it. “They provide a really good internal space, it’s very useable. Just swing the wide doors open and you can see everything in the refrigerator. 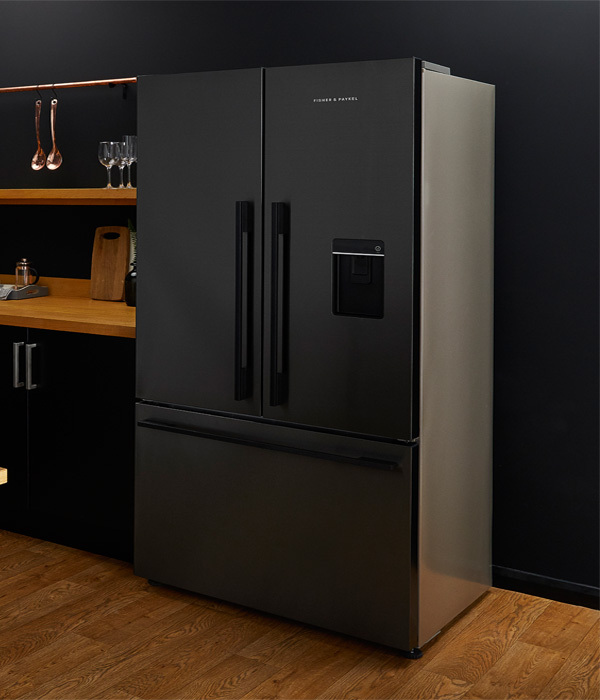 “Fisher & Paykel has now introduced a very stylish black stainless steel finish to its range (RF540ADUB5), so if you’re hankering for a dark, on-trend kitchen, this would be the perfect cooling appliance. Last month saw Helen Crouch of Concept & Completion choose her favourite products from our November issue.